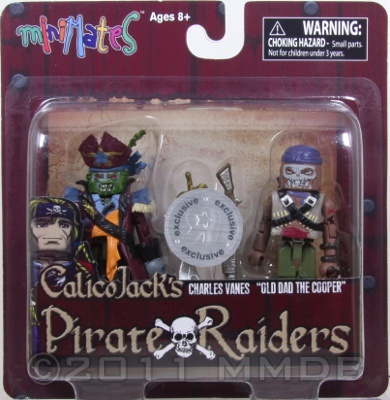 Minimate Database: Charles Vanes & "Old Dad The Cooper"
Charles Vanes: The Evil Captain himself. When he is not plundering the Caribbean seas and wreaking havoc on the Spanish and English forces, he and his undead crew seek their revenge on the author of their downfall, Calico Jack. "Old Dad The Cooper": When Vanes learned that Fenwick, years earlier, had been tried and convicted of being a member of Jack's Crew, he knew he would have a willing ally in his quest for revenge. Vanes uses his Dark power to raise Fenwick fromt he bottom of Port Royale harbor where he lay.